In the autumn of 1920, at the height of the Tan War, republicans imprisoned in camps and jails throughout the country intensified their fight to be treated as prisoners of war. By August, political status won by republican prisoners following the death on hunger strike of Thomas Ashe in September 1917 and more recently after the two-week-long mass hunger strike in Mountjoy Jail in April 1920, which saw the release of many of those engaged in the fast, was withdrawn by the British. From now on, republican prisoners were to be treated as ‘criminals’. On 11 August, a mass hunger strike began in Cork Jail when 60 IRA Volunteers, most of them held without charge or trial, embarked on a fast in support of their demand for political status and release. The British government, whose attitude had hardened following the successful hunger strike of the previous months, decided to risk the deaths of prisoners rather than concede their demands. During the weeks that followed, the British released or transferred many of the hunger strikers until only eleven were left of the original 60. 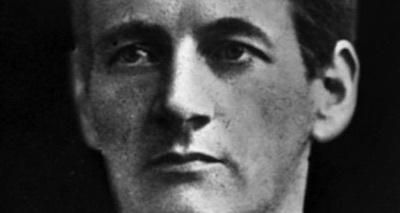 On 12 August 1920, Terence MacSwiney, Lord Mayor of Cork, TD for mid-Cork and O/C of the IRA No.1 Brigade and ten others were arrested during a raid on the City Hall, Cork, and immediately joined the hunger strike in Cork Jail, which had begun the previous day. He was deported that night to England and conveyed to Brixton Prison, London, where his hunger strike continued. During September and October 1920, as the hunger strikers in Cork Jail deteriorated, crowds gathered daily outside the jail to pray and sing hymns. World attention, however, was focused on MacSwiney’s lonely struggle in Brixton Prison. On Monday, 17 October 1920, having endured the agonies of hunger-strike for 67 days, Michael Fitzgerald, one of the prisoners in Cork Jail, died. The following Thursday, despite intimidation of mourners by heavily armed British forces, thousands of people attended his funeral in Fermoy. The following Monday, 25 October, another of the Cork prisoners, Joseph Murphy, died on his 76th day of hunger strike. His body, accompanied by IRA Volunteers and members of Cumann na mBan, was brought through his native Cork City and the following day he was buried in the Republican Plot in St Finbarr’s Cemetery. Several hours before Murphy’s death, MacSwiney, after 74 days on hunger strike, died at 5.40am in Brixton Prison, London. His heroic struggle had ended. On Wednesday, 27 October, an inquest was held in the prison and that night MacSwiney’s body was delivered to his relatives. The remains were removed to Southwark Cathedral, where they were received by Archbishop Mannix. Thousands filed past the coffin to pay their last respects. On Thursday morning, thousands followed the cortege headed by IRA Volunteers and members of Dail Eireann and Cork Corporation to Euston Station, while thousands more lined the route. The remains were taken by train to Hollyhead but the British government, fearing the effects of MacSwiney’s body arriving in Dublin and travelling down through the country to his native Cork, seized the body and transferred it by sea directly to Cork. Cork IRA Volunteers were out in force to meet the remains and MacSwiney’s body was brought to the City Hall for a lying-in-state, where thousands more filed past. On Sunday, 31 October, the funeral took place to St Finbarr’s Cemetery, where MacSwiney was laid to rest in the Republican Plot beside his friend and comrade Tomas Mac Curtain. The hunger strike in Cork Jail continued for a further three weeks. At the request of Arthur Griffith, acting President of the Irish Republic, the remaining nine prisoners on hunger strike ended their fast on 12 November 1920. Michael Fitzgerald, Joseph Murphy and Terence MacSwiney died on hunger strike on 17 and 25 October 1920, respectively, 95 years ago.